There are so many varieties of nectarines these days that I try to sample a few new ones each summer! This time round it has been the year of these bright yellow-green mango nectarines and just as the name implies it has a little hint of mango flavor built in. I personally find the mango taste to be subtle and delicate but it is still very much present and hard to miss. The skin is slightly bitter but goes well against the juicy sweetness of the fruit. On a sunny day in summer I like to fire up the grill on the terrace however not all summer days are bright and sunny and I still have the urge to grill so this weekend I decided to use my cast-iron grill pan indoors and get my fix. Summer vacations in Mumbai/Bombay meant engaging in several different kinds of street foods. From frozen to hot, from sweet to spicy, the melange was pretty varied and delicious. I would practically spend each day waiting to try out something different and indulge my tastebuds. This sweet tamarind chaat chutney is one of my favorite staples that I practically make a few times every year. It's bold tart, sweet and mildly spicy flavors make it simply perfect and I constantly incorporate it in different dishes at home. 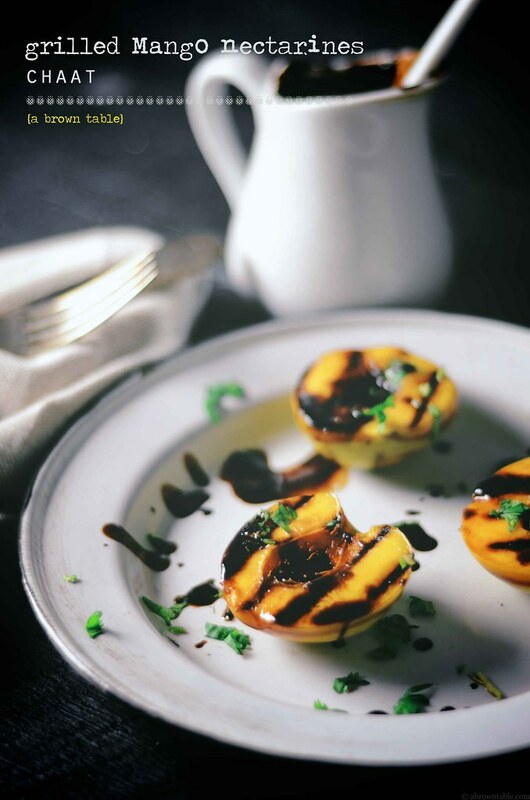 Grilled mango nectarines drizzled with a little fresh lime juice and the dark brown tamarind chutney make such a refreshing and delicious meal. This dish can be served at the start of a meal as an appetizer or even as a small accompanying salad or as a light dessert to end a heavy meal. Either way you won't be disappointed. 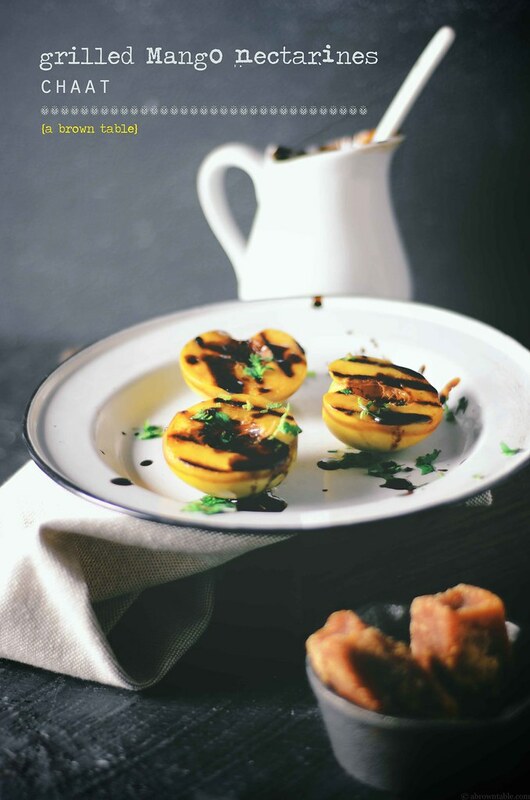 The nectarines can be substituted with peaches and even apricots or any other fruit that can withstand grilling. A couple of notes here, I always make a batch of the ground chaat spice mix and store it away for those moments when I crave the sweet tamarind chaat chutney. Though it requires the use of several different spices it is well worth the effort when you taste that explosion of flavors in your mouth. I think this chutney can be canned but I have never tried to. It has enough acidity and sugar, so it should work. The consistency of the chutney can be adjusted by adding more or less water, I like it slightly thick and consequently the thicker the sauce the more concentrated the taste, so I use less sauce while serving. Black salt is a popular Indian salt that is also called "kala namak" which is dark brownish red in color and has a smoky flavor. If you can't find this, then use regular sea salt but black salt does provide a unique taste to the chutney and it would be worth the effort to find it at an Indian grocery store or at Amazon. 1. Heat a skillet on a hight flame and toast the cumin, coriander, black peppercorns, cloves and cardamom for 1 minute until they just begin to smoke but not burn. Immediately transfer the spices to a coffee or spice grinder along with the chili, amchur, cinnamon, and ginger and grind them to a fine powder. Store the chaat spice mix in an airtight container until needed, it will keep fresh for up to six months. 2. 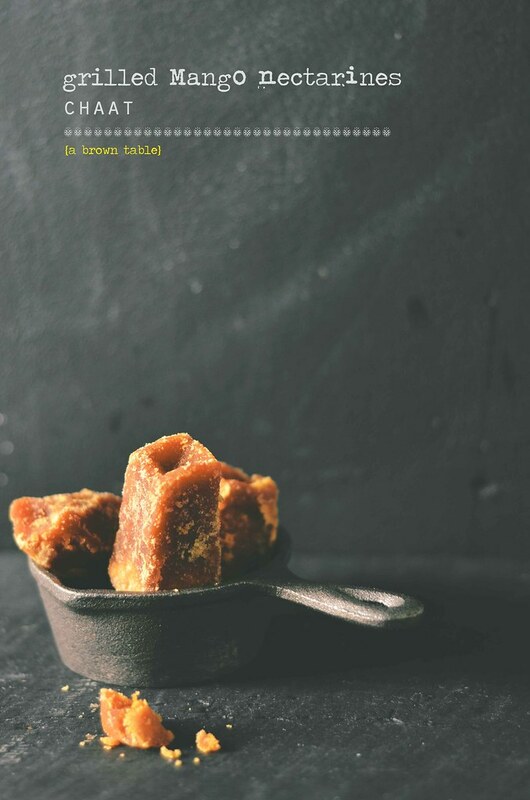 In a thick bottomed saucepan, add 1 tablespoon of the ground chaat spice mix, the tamarind paste, water, jaggery, and salt. Bring the contents to a boil on a high flame and immediately reduce to a gentle simmer and cook for another 5 minutes with constant stirring. Adjust the amount of salt if necessary. This sauce can be made in advance and stored in the refrigerator for up to 2 weeks or in the freezer for a month. 1. 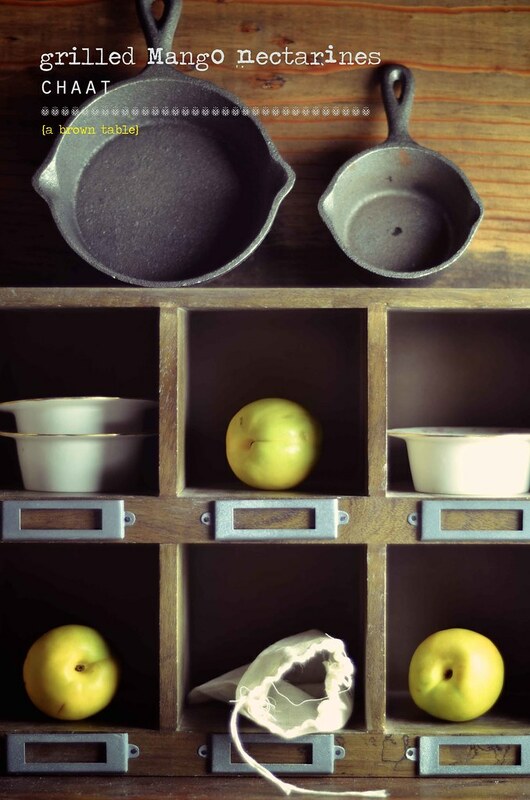 Wash and dry each nectarine, slice each of the fruit in half and remove the stone. Reserve one tablespoon of the oil and use the rest to lightly brush each nectarine (you do not need to brush the nectarines with all the oil, just a little to prevent the from sticking). Keep aside. 2. Brush a cast-iron grill pan with the reserved oil and then heat it on a high flame until it begins to smoke. Place the exposed cut ends of the fruit facing downwards on the hot grill surface and allow them to sear for 3- 4 minutes. Remove immediately and transfer to a serving plate. Garnish with the fresh cilantro and squeeze the juice of the lime over the nectarines. 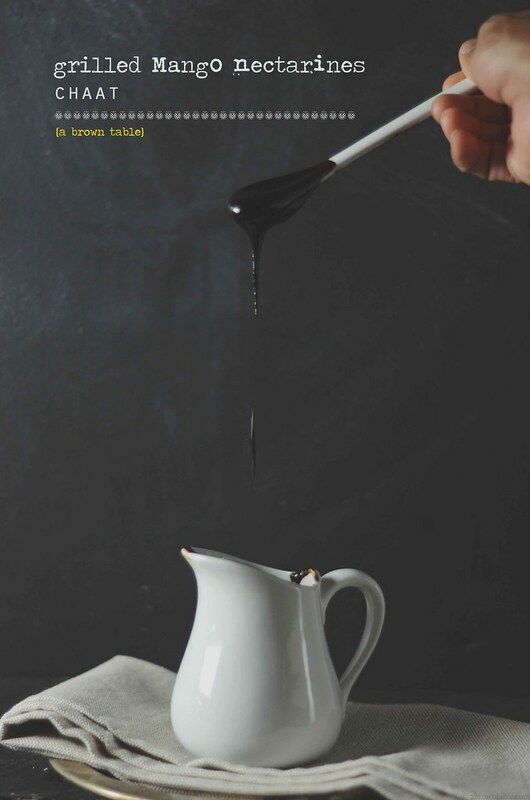 Drizzle with a little or as much as you want of the tamarind chaat chutney before serving. In "Chaat", "Grilling", "Indian", "grilled fruit", "mango nectarines", "nectarines", "tamarind chaat sauce"